This rustic wedding invitation is given a romantic finish, but really it's only the beginning! 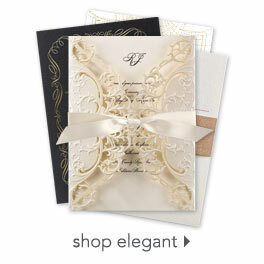 Your wording is printed in white against a wood grain background and accompanied by a finishing touch of white lace. Your names and wedding date are printed on the first panel, your photo is printed on the second panel and your wording is printed on the third panel. Choose up to two lettering styles for your wording. Invitation includes inner and outer envelopes. These were perfect for our rustic themed wedding. Shipping was super fast as well. I received the finished product in less than a week from the day I ordered . I am so happy with the invitations! We have received so many compliments on how beautiful they are! While ordering I was able to chat with employees from the site and they answered my questions quickly and helped make this easy process even easier. I will definitely order from this company again! The order was delivered quickly. The invitations look bigger in person, making the center photograph really pop! Our rustic theme is perfectly carried out by these invitations and I highly recommend them. The photo is especially sharp and vividly/true colored. I am very happy with these! I ordered these for wedding invites and could not be happier with the the final product! The paper is thick and holds up well, the picture quality is great, I selected a verse that fit us perfectly, there is nothing I am not happy with! I was so excited to get these mailed out to everyone, invitations were the last thing I thought I would be excited about but I'm really thrilled! I simply loved these cards and this site. I felt the cards were very professionally done and those family/friends we sent them to felt the same. I would use Invitations By Dawn again. These turned out beautifully! Exactly like the template, great quality. Customer service is excellent! Delivery was fast and free! We were so happy with the invites. The design team listened to our special instructions perfectly, and we did not order a copy to make sure it was done right before hand. The paper quality is fabulous, definitely quality- in the paper and printing. Very fast order and shipping time- packaged very well and super professionally. Would recommend over and over! I love this company! very fast shipping - arrived in perfect condition and well packaged.